If you are going full desktop replacement I think the Clevo might be better. At least the 9700K or 9900K options will make it last a while even if graphics become difficult to upgrade. It will be interesting if Dell price matches... when a manufacturer makes a new model, they are less prone to price match due to losses. I can't see them knocking nearly a grand off! Clevo will gain my business unless another contender comes along. Oh wow, that is a huge difference, and I can't really see why. Yeah I am not sure I can recommend paying close to 1k more for the "same" system. 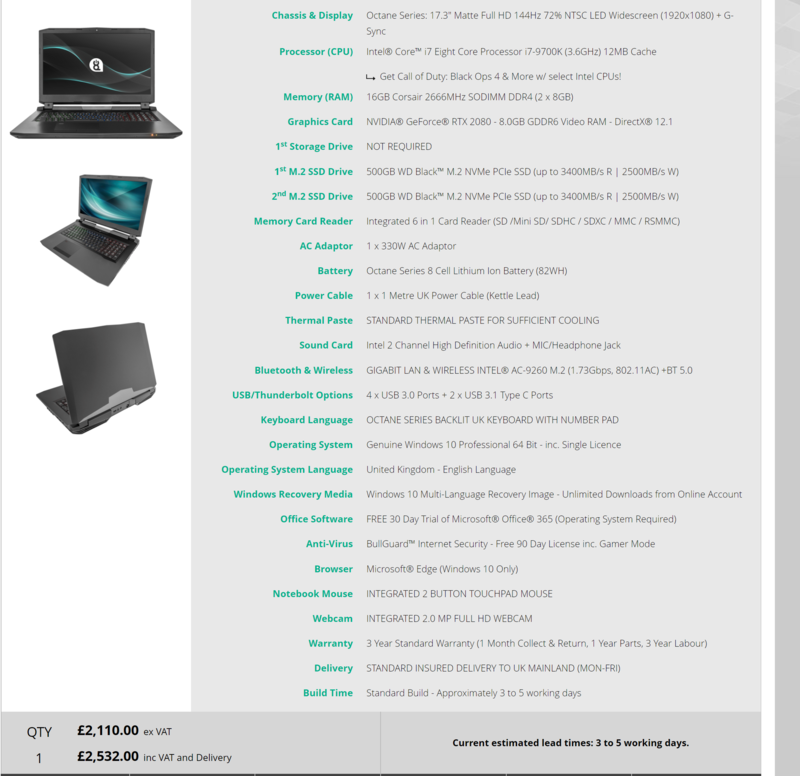 Paying a grand to Dell for an Alienware badge and tobii eye tracking is still ridiculous. If you have a 1070, why upgrade to a 2000 series GPU, especially when the new laptops are still shipping with 1080p displays? You might as well just wait for the 3000 series after the new Sony and Microsoft consoles come out next year. These Turing GPUs just don't justify spending $3 grand on a whole new machine, just to get a GPU that has maybe 20-25% over the 10 series you already own. If they had full bore desktop chips it'd be another matter, but the 2000 series had to be pared down too much to fit in laptops. Every single chip should be considered a Max-Q in my opinion. Techdude594, hmscott and MiSJAH like this. 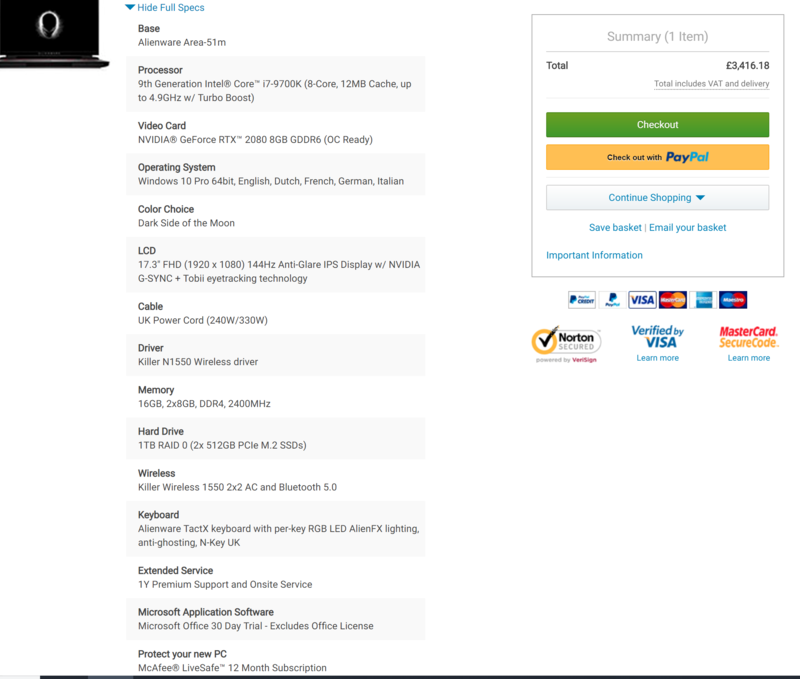 Selling the X5V7 and adding a grand will get me 144hz, I7-9700K DT CPU, RTX 2080, 32GB 2666Mhz, and 1TB PCIe SSD that's a reasonable upgrade from a 60Hz 4K panel, I7-7820HK, GTX 1070, 16GB 2400Mhz, and 500 GB PCIe SSD for a grand. they're coming with high-refresh rate displays. so asus is releasing a 2070 with a 240Hz display. If the X5 still gets you that much value I wouldn't blame you. I mean if MSI gives me a really good deal I'll be in a similar position. Otherwise I'm good with my GT73. 240Hz is completely worthless for modern gaming, there's no GPU that can utilize it. ASUS is going to charge a huge premium for the SKUs with that display too. hmscott and MiSJAH like this.